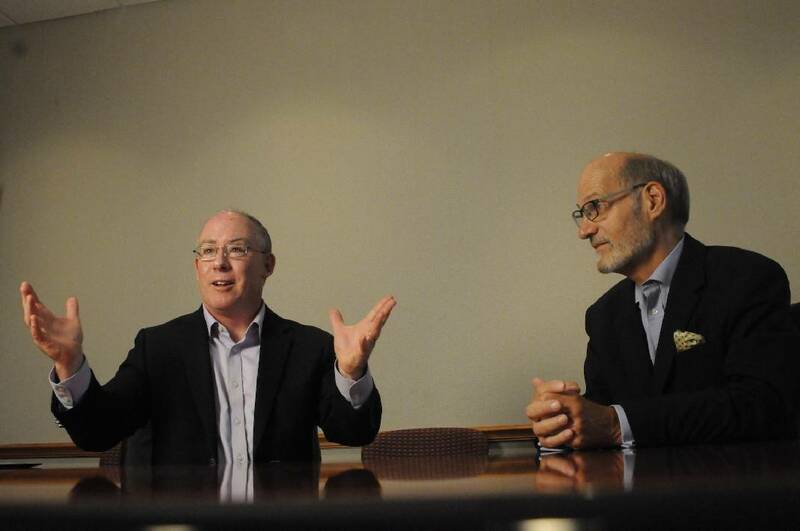 Dr. Charlie Self, left, and Clark Taylor talk about the Institute of Faith and Work in an interview at the Times Free Press. The average person spends more than 90,000 hours in their lifetime at work. For some, work is viewed as a drudgery to be endured until retirement. For others, it is simply a source of income needed to support the rest of their lives. For many others, though, work is not just their source of income, it is also their source of identity and self-worth. Work is the great shared experience for most people, but the organizers of a new faith-based group in Chattanooga think churches and individual believers have little shared understanding about why and how we do it. The Institute of Faith and Work launched its Gotham Fellowship Program this fall. The nine-month training for 14 local buisness and community leaders provides theological, spiritual and relational foundations to better integrate faith and work, based upon the Gotham Fellowship Program in New York by the Center for Faith and Work.. The Chattanooga sessions are being led by Robby Holt, senior pastor of North Shore Fellowship, and co-author of Practicing in the King’s Economy—Honoring Jesus in How We Work, Earn, Spend, Save and Give. Hicks Armor, senior vice president, Brown & Brown Insurance. Ashley Baldwin, account representative with Canaan Group & Associates. Dr. Jessica Bianco, veterinarian with Dalton Animal Care & Regional Institute for Veterinary Emergencies and Referrals. Tammy Davis, advancement assistant, Baylor School. Lakweshia Ewing, vice president of community impact, United Way of Greater Chattanooga. Julia Friedman, 340B program coordinator, Erlanger Health System. Evann Gibson, vice president, Kenco Material Handling Solutions. Jim Gilliland, president, JG Communications Group. Dr. Cy Huffman, senior medical director, BlueCare Tennessee, BlueCross BlueShield of Tennessee. Jason Mitchell, real estate coordinator, Equitas Management Group. Renee Nail, executive director, Scenic City Women’s Network. Scott Soltau, senior vice president of Capital Markets, FinTrust Investment Advisors. Carl Sheffield, senior solutions engineer with Skuid. Dan Wycoff, chief financial officer, Branch Technology. 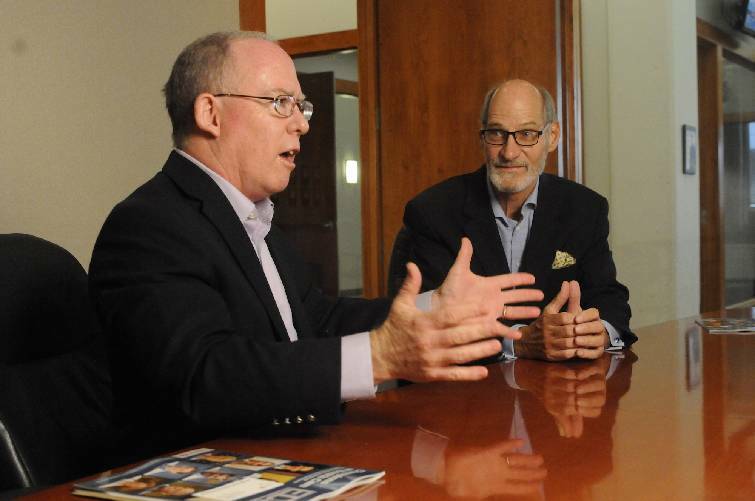 Dr. Charlie Self, left, director of city development for the ministry Made to Flurish, has partnered with the Chattanooga Institute for Faith and Work, which was cofounded by Dr. L. Clark Taylor, right. Dr. L. Clark Taylor, a retired health care executive who became a United Methodist pastor late in life, helped form the new Chattanooga Institute for Faith and Work to promote the value, virtues and dignity of work, whether it is paid or unpaid. "Any work that is moral is pleasing to God," says Taylor, a former CEO of CHI Memorial Hospital and Hospice of Chattanooga who is now the minister of Faith & Works at First-Centenary United Methodist Church. "Work itself is meaningful; it is not just a means to an end." Although Chattanooga has been described as one of the most Bible-believing cities in the nation, Taylor believes the theology about work is broken for many in Chattanooga. "Scriptural guidance about vocation and calling is forgotten or misunderstood," he says, "Faith work is what ministers and missionaries do. Real work is what the rest of us do. See you next Sunday." Bill Stiles, a 40-year marketing veteran and Baptist Sunday school teacher who is another co-founder of the institute, said too often Christians think of faith vocations as those who are called to become ministers or missionaries, not those who work as plumbers, bankers or retail clerks. "The altar call at the end of most services asks if anyone wants to be saved or wants to enter full-time ministry," Stiles says. Stiles and Taylor stress that all work should be faith-based and they contend that the cultural divide of faith from work means there is less meaning, less joy and a lesser quality of life for individuals and the community. "Broken ideas about faith and work also contribute to shaky ethics, lower expectations of self and others, pessimism, cynicism, abuse and indifference," the new institute proclaims on its website. "In fact, it's possible to trace many of the community's worst problems — poverty, violence, illiteracy, preventable disease — to our broken theology of work." Through training, seminars and teaching programs for both clergy and laity, the institute is working to make work about more than a paycheck. To aid local pastors in teaching about faith and work, the institute recently brought the leader of the Denver-based Made to Flourish foundation to town to talk with local pastors about developing a network of pastors and their churches to better integrate faith and work in the community. Dr. Charlie Self, director of city development for Made to Flourish, said the ministry has created local chapters in two dozen cities in its first three years and has a goal of 50 cities within a decade, in addition to partnering with other groups like the Chattanooga Institute for Faith and Work. "We focus on pastors and how uniquely they shape their communities and can influence a community," Self said during a recent visit to Chattanooga. "When the clergy really commission and bless what the people do all week as equally important to what they do on Sunday or at church, paradoxically they will have more margin to help their church. But if they feel what they do all week is secondary, then you will always have reluctant volunteers. The idea is to really bless the scattered work of the people of God, then the gatherings take on a whole new life." Taylor said most churches and clergy "are really focused on doing Sunday well with great worship, teaching and fellowship experiences. "But we need to do more in how we influence individuals and our community during the workweek Monday through Friday," Taylor says. In response to the movement to better integrate faith and work, Self said that local churches across the country are starting to incubate businesses and resourcing public, private and home-schooling networks. "We're seeing initiatives that are both charitable and entrepreneurial," Self says. "We need to integrate faith, work and economic wisdom into what churches do." Self's own experiences helped shape his view of work. When a church and seminary job in Silicon Valley unexpectedly ended just after Self had moved to back to California from the East Coast, the church historian and Assemblies of God minister took on other jobs, working as a clerk in a self-service gas station and marketing stationary while teaching nights at a Bible college. "All of my clergy friends were saying that I needed to get you back in the ministry," Self recalls. "That's when my shift in thinking occurred. I'm still called to the pastoring and teaching I do. The fact that I am earning a living a different way doesn't change my giftedness or my contribution." Self no longer uses phrases like "full-time ministry" or "bi-vocational pastors," noting that most clergy around the world work two or three jobs. Taylor said for too many people of faith, there is a divide between what is sacred in the church and what is secular in the workplace. The bottom line of business needs to be about more than just making money but broadened to a triple bottom line focused on people, profit and the planet, Taylor says. "When followers of Christ are clear about the over-arching impact of their vocation, career path and job, they should be motivated to do their work with excellence, in a distinctively Christian manner, with a profound impact on community and the world culture," he says.